A man-made diamond bracelet featuring four round brilliant diamonds set on the ends of a two-row open bangle cuff. Made to order to fit your wrist. Available options: platinum, 14k or 18k gold: white, yellow, rose. 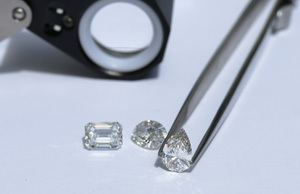 Our friendly Concierge team is happy to assist you in choosing the perfect round brilliant lab diamonds in the size and price range of your preference. Ada Diamonds Design Description- This delightfully modern bracelet features four round brilliant lab grown diamonds in 14k white, yellow or rose gold settings. Makes an excellent gift for a mother of four children or to celebrate a four year anniversary. Additional Description- Made to order to fit your wrist! Starting at pricing assumes matched pairs of GH, SI1 lab grown diamonds set in 14kt gold. Additional fees for 18k: $150, platinum $300.